ABC Homes is the newest addition to the VistaCana line of products. 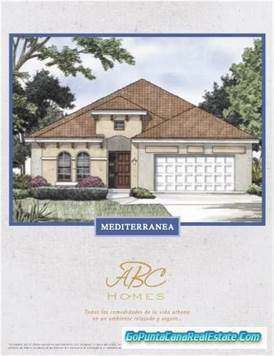 These will be Florida style homes with central a/c and quality finishes. Buyers will be able select type of flooring, finishes, and colors. Some at the base price and some will incur additional charges. VistaCana is the newest blossom growing in the paradise of Punta Cana, Dominican Republic. Located 15 minutes from Punta Cana International Airport (with direct flights from major US, Canadian and European cities), with a collection of villas, townhomes and condos puts the beauty and luxury of vacation living easily within your reach. And presents one of the best values in the Dominican Republic. Right now, a second home in a Caribbean paradise is amazingly affordable. And even more so for those who are among the first to take advantage of this limited opportunity. The journey begins here. Your journey to a lifestyle that every day exceeds your expectations —but falls far short from your cost expectations!